T20Q - is funded primarily by the UK Department for International Development (DFID) through their KNOW-FOR grant to CIFOR. T20Q - top twenty questions for forestry and landscapes is a project within the broader Evidence-Based Forestry (EBF) initiative, led by CIFOR and its partners. T20Q is a global project that allows you to have your say about issues of importance. From May through November 2014 we collected your questions of high priority for research and policy in forestry and landscapes. We indexed and sorted over 2500 of these questions and arranged them into the most commonly-occurring themes that emerged from the indexing exercise. These were ranked by you during December. We counted up all the scores and produced a final set of Top Twenty Questions. See the T20Q results now! There were three main ways in which people engaged with the T20Q project. The first online survey was launched in May 2014 to collect questions. We also asked for brief details about respondents - which part of the world people are from, what type of organisation they are working in, how old they are, whether they are female or male, etc. Those responses will remain confidential. We promoted T20Q through Twitter @Forestry_Q using the hashtag #t20q and collected some questions along the way. Many of the people who were active on Twitter are pictured on the homepage displaying some of their priority questions. We are very grateful to them! During the year we engaged with people at conferences and workshops, asking them to submit questions to T20Q. We were very encouaraged by people’s enthusiasm for the project. T20Q sees forestry from a broad and inclusive perspective and we are deliberately not defining terms rigidly. There is a lot of focus currently on Sustainable Development Goals (SDGs) - they may not specifically mention forestry, but forests make positive contributions across most of the goals. Your questions can reflect this way of thinking about forestry. More traditional, or perhaps technical, ways of viewing forestry - silviculture, forest management, plantations vs natural forests, tree breeding, timber production - still have relevance, of course. T20Q will capture your questions on these topics. We want to encourage as many people as possible to engage and join the conversation about what issues are most important for research and policy. 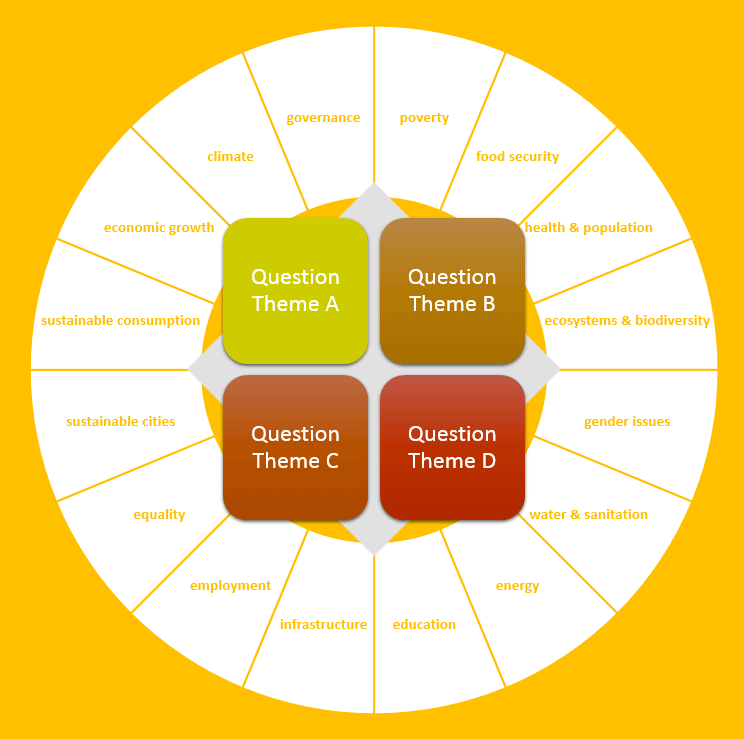 The online survey will allow you to submit your questions in one of the four broad categories at the centre of the schematic. Later the T20Q team may review in which categories each are most appropriate. They will be grouped into many different focal topics that reflect the variety of priorities that emerge from your questions. Think broadly - if any aspect of forestry or trees in the landscape is important to you then we want to hear from you. Think about scale - your priority questions may have relevance only to your location, or they may have wider relevance. We want questions at any scale. T20Q - top twenty questions for forestry and landscape - is a project within the broader Evidence-Based Forestry (EBF) initiative, led by CIFOR and its Partners. EBF is a “collaboration without walls” that aims to improve the quality and relevance of science and policy in forestry and landscape management. There is growing interest in widening public participation in environmental decision-making and an awareness of the importance of framing research questions which reflect policy needs. T20Q builds on earlier exercises that identified key forestry and conservation priorities (read more). It will encourage broad ‘stakeholder’ involvement in a bottom-up approach to finding out what people view as the questions of high priority for research and policy. 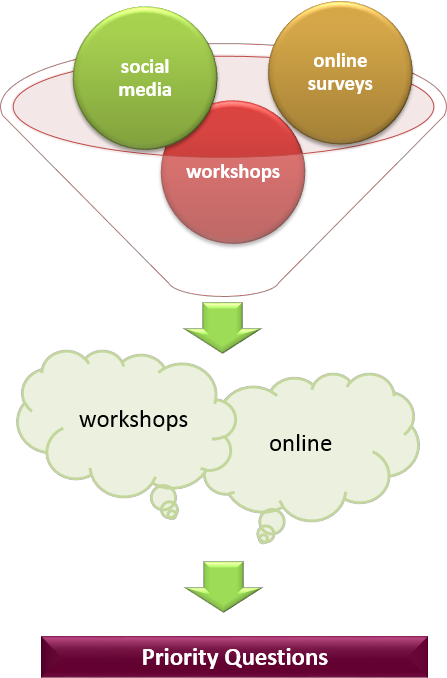 This is why we are making it as easy as possible for you to engage and submit your questions - online and at workshops. Outputs from T20Q can feed directly into the question-framing element of EBF, but they can also be used for many other purposes - to suggest new research or policy agendas, reveal knowledge gaps, and open up areas for further discussions across disciplines. The project will use an iterative internet survey approach, coupled with workshops, to determine what the priorities are for forestry and landscapes research and policy. This project will foster conversations between individuals and organisations with an interest in setting priorities for research, policy and ultimately practice. Questions submitted through in Phase 1 have been sorted and organised into topics that reflect the most frequently-occurring themes. These are presented in sets of questions for further consolidating online through a ranking process. We initially collecting questions in broad themes but the themes presented in Phase 2 reflect the most frequently-occurring topics that emerged from the questions submitted in Phase 1. There are 7 cross-cutting themes in the Phase 2. Over 2500 questions have now been sorted into 7 broad themes that reflect the most frequently-occurring topics and themes emerging from these questions. Petrokofsky G, Hemery GE, Brown ND 2013. Matching a scientific knowledge base with stakeholders’ needs: the T10Q project as a case study for forestry. Forest Policy and Economics 37, 29-36. The extent and provenance of the existing global knowledge base were qualified in relation to ten specific questions of priority to forestry research. The ten questions were derived from a participatory exercise; the Top Ten Questions for Forestry research (T10Q) completed in 2008. Analysis of the first-ranked question, relating to invasive species, pests and diseases, revealed a lower than expected volume of published European literature, compared with the other nine questions and overall database figures. Analysing the published scientific literature of relevance to the T10Q demonstrated a novel method of using bibliometrics to link stakeholder priorities with the existing knowledge base to provide a richer picture of the state of scientific evidence available for decision-making. Seddon, AWR, Mackay, AW, Baker, AG et al. 2014. Looking forward through the past: identification of 50 priority research questions in palaeoecology. Journal of Ecology 102 (1), 256–267. Priority question exercises are becoming an increasingly common tool to frame future agendas in conservation and ecological science. They are an effective way to identify research foci that advance the field and that also have high policy and conservation relevance. To date, there has been no coherent synthesis of key questions and priority research areas for palaeoecology, which combines biological, geochemical and molecular techniques in order to reconstruct past ecological and environmental systems on time-scales from decades to millions of years. We adapted a well-established methodology to identify 50 priority research questions in palaeoecology. Using a set of criteria designed to identify realistic and achievable research goals, we selected questions from a pool submitted by the international palaeoecology research community and relevant policy practitioners. The integration of online participation, both before and during the workshop, increased international engagement in question selection. The questions selected are structured around six themes: human–environment interactions in the Anthropocene; biodiversity, conservation and novel ecosystems; biodiversity over long time-scales; ecosystem processes and biogeochemical cycling; comparing, combining and synthesizing information from multiple records; and new developments in palaeoecology. Future opportunities in palaeoecology are related to improved incorporation of uncertainty into reconstructions, an enhanced understanding of ecological and evolutionary dynamics and processes and the continued application of long-term data for better-informed landscape management. Synthesis. Palaeoecology is a vibrant and thriving discipline, and these 50 priority questions highlight its potential for addressing both pure (e.g. ecological and evolutionary, methodological) and applied (e.g. environmental and conservation) issues related to ecological science and global change. Pretty, J, Sutherland, WJ, Ashby, J et al. 2010. The top 100 questions of importance to the future of global agriculture. International Journal of Agricultural Sustainability 8(4), 219–236. Despite a significant growth in food production over the past half-century, one of the most important challenges facing society today is how to feed an expected population of some nine billion by the middle of the 20th century. To meet the expected demand for food without significant increases in prices, it has been estimated that we need to produce 70–100 per cent more food, in light of the growing impacts of climate change, concerns over energy security, regional dietary shifts and the Millennium Development target of halving world poverty and hunger by 2015. The goal for the agricultural sector is no longer simply to maximize productivity, but to optimize across a far more complex landscape of production, rural development, environmental, social justice and food consumption outcomes. However, there remain significant challenges to developing national and international policies that support the wide emergence of more sustainable forms of land use and efficient agricultural production. The lack of information flow between scientists, practitioners and policy makers is known to exacerbate the difficulties, despite increased emphasis upon evidence-based policy. In this paper, we seek to improve dialogue and understanding between agricultural research and policy by identifying the 100 most important questions for global agriculture. These have been compiled using a horizon-scanning approach with leading experts and representatives of major agricultural organizations worldwide. The aim is to use sound scientific evidence to inform decision making and guide policy makers in the future direction of agricultural research priorities and policy support. If addressed, we anticipate that these questions will have a significant impact on global agricultural practices worldwide, while improving the synergy between agricultural policy, practice and research. This research forms part of the UK Government’s Foresight Global Food and Farming Futures project. Petrokofsky, G, Brown ND, Hemery,GE et al. 2010. A participatory process for identifying and prioritizing policy-relevant research questions in natural resource management: a case study from the UK forestry sector. Forestry 83, 357-367. There is growing interest in widening public participation in research and practice in environmental decision making and an awareness of the importance of framing research questions that reflect the needs of policy and practice. The Top Ten Questions for Forestry (T10Q) project was undertaken in 2008 to investigate a process for compiling and prioritizing a meaningful set of research questions, which were considered by participating stakeholders to have high policy relevance, using a collaborative bottom-up approach involving professionals from a wide set of disciplines of relevance to modern forestry. Details are presented of the process, which involved an online survey and a workshop for participants in the UK and Republic of Ireland. Survey responses were received from 481 researchers, policy makers and woodland owners, who contributed 1594 research questions. These were debated and prioritized by 51 people attending the workshop. The project engaged people who were outside the traditional boundaries of the discipline, a trend likely to be more important in the future, particularly in the light of complex problems connected with climate change, bioenergy production or health and well-being, for example, which require multidisciplinary partnerships within the research and policy communities. The project demonstrated the potential for combining web-based methods and focussed group discussions to collect, debate and prioritize a large number of researchable questions considered of importance to a broad spectrum of people with an active interest in natural resource management. Sutherland, WJ, Adams, WM, Aronson, RB et al. 2009. One hundred questions of importance to the conservation of global biological diversity. Conservation Biology 23, 557-567. Abstract: We identified 100 scientific questions that, if answered, would have the greatest impact on conservation practice and policy. Representatives from 21 international organizations, regional sections and working groups of the Society for Conservation Biology, and 12 academics, from all continents except Antarctica, compiled 2291 questions of relevance to conservation of biological diversity worldwide. The questions were gathered from 761 individuals through workshops, email requests, and discussions. Voting by email to short-list questions, followed by a 2-day workshop, was used to derive the final list of 100 questions. Most of the final questions were derived through a process of modification and combination as the workshop progressed. The questions are divided into 12 sections: ecosystem functions and services, climate change, technological change, protected areas, ecosystem management and restoration, terrestrial ecosystems, marine ecosystems, freshwater ecosystems, species management, organizational systems and processes, societal context and change, and impacts of conservation interventions. We anticipate that these questions will help identify new directions for researchers and assist funders in directing funds. Sutherland, WJ., Armstrong-Brown, S, Armsworth, PR et al. 2006. The identification of 100 ecological questions of high policy relevance in the UK. Journal of Applied Ecology 43, 617-627. Evidence-based policy requires researchers to provide the answers to ecological questions that are of interest to policy makers. To find out what those questions are in the UK, representatives from 28 organizations involved in policy, together with scientists from 10 academic institutions, were asked to generate a list of questions from their organizations. During a 2-day workshop the initial list of 1003 questions generated from consulting at least 654 policy makers and academics was used as a basis for generating a short list of 100 questions of significant policy relevance. Short-listing was decided on the basis of the preferences of the representatives from the policy-led organizations. The areas covered included most major issues of environmental concern in the UK, including agriculture, marine fisheries, climate change, ecosystem function and land management. The most striking outcome was the preference for general questions rather than narrow ones. The reason is that policy is driven by broad issues rather than specific ones. In contrast, scientists are frequently best equipped to answer specific questions. This means that it may be necessary to extract the underpinning specific question before researchers can proceed. Synthesis and applications. Greater communication between policy makers and scientists is required in order to ensure that applied ecologists are dealing with issues in a way that can feed into policy. It is particularly important that applied ecologists emphasize the generic value of their work wherever possible.